Ava DuVernay‘s adaption of the classic has some great performances and eye popping visuals but is so slick that it slips off the screen and out the door before making much of an impression. 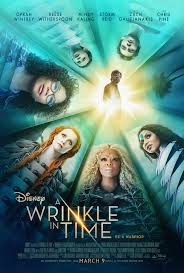 The film is the story of a young girl, her brother and friend who travel through time and space to rescue her dad who has been kidnapped by a great evil. I read the book back in fourth grade and fell in love with it. While I never finished the rest of the series, I always had a soft spot in my heart for the original. What always struck me about it was that it was kind of unfilmable. It’s one thing to describe the wonders and have your imagination take over and go to town and another to make them concrete for everyone. As spectacular as things are in this film they never matched what was in my head. (The lack of huge scope was one of the things that hurt the first version of the film). Slickly produced by Disney the film has no grit and no weight. As troubling as the story is in the novel, in this version it always seems like it will all be okay- I mean it’s Disney. Things will never get too dark. (One of the things the earlier did right was create some tension). The cast is fine if overly star studded (Oprah unbalances it- she is always Oprah). While I did get misty at the end of the film, I really hated myself for getting teary. To me the film didn’t earn it but played a series of easy tropes to get the tears. Worth a look on Netflix, but I wouldn’t pay to see it.